Vibra-TITE 131 Permanent Strength Threadlocker is a product designed to provide medium-high strength threadlocking where controlled torque / tension is required. Material lubricates during assembly, securing parts with medium-high strength retention allowing disassembly when required. Best for applications where parts require locking strength but may need to be disassembled. Vibra-TITE 131 resists vibrational loosening however if used on large diameter bolts or where there is a long engagement of the fastener, the application of heat may be required for removal. Ensure parts are clean, dry and free from oil and grease before use. Product is normally hand applied from the bottle onto threaded parts. Fixture Speed with Primer is (5 seconds. Fixture Speed without Primer is 30 minutes at 77 degree F. Shelf Life is 12 months at 68 degree F. 24 hours at 68 degree F Full Cure Time. 150-250 inches/lbs Typical Breakaway Strength. 50-150 inches/lbs Typical Prevailing Strength. Product should be stored in a cool and dry location at temperatures between -10 degree C to 30 degree C. Optimal storage is 22 +/- 4 degree C. Shelf life is 18 months from date of manufacture when stored at 22 +/- 4 degree C. Suitable for applications where disassembly is not required. Permanently locks nuts or bolts up to 3/4' in diameter. Heat and hand tools required for disassembly. 0.007 inches Maximum gap fill. 200/100 lbs Torque strength, Break/Prevail. 1.05 Specific gravity. N or T Suggested primer. 2 ml Bullet Tube. 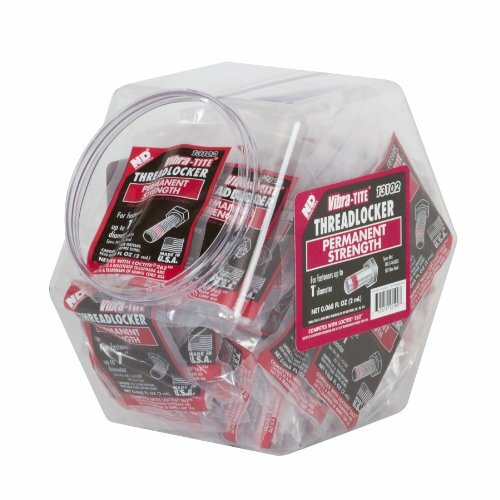 Fishbowl comes stocked with 100 bullet tubes.